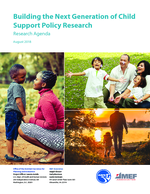 This project brought together policymakers, practitioners and evaluators in October 2017 to identify key policy research questions in the child support program. The discussions, coupled with a series of informant interviews from 2016, led to the development of the research agenda. It is a framework for the broader child support community to collectively answer pressing policy questions over the next decade.